10K or 14K Gold? 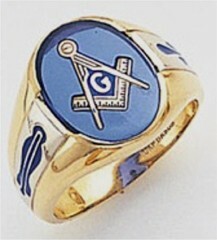 Which is the Best for Masonic Rings? I am often asked the difference between the varying qualities of gold and which is my preference in the Masonic Rings that we sell. It is probably simplest to begin by having explanation of the difference. 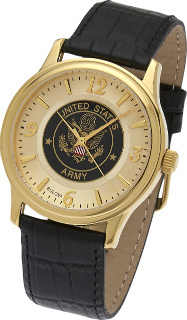 24K gold is the purest and is typically what I would refer to as "investment gold". Typically 24K gold is not ideal for jewelry because it's too soft; therefore it damages easily and sometimes would be considered by many as too heavy to wear for jewelry. 22K gold is used by dentists as it is easy shape and fit, but a small addition of an alloy makes it much harder wearing, but no so hard that it wears down the opposing teeth. When you continue to reduce the quantity of gold in your piece of jewelry, other alloys are mixed with the gold prior to gold being poured into the mold. 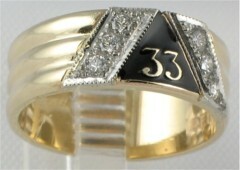 Most men's or women's rings are produced from 14K or 10K gold. Some are made of 9K because they are hard-wearing and fine for mass-market jewelry. Silver is usually the desired metal to "dilute" gold with as it's also a precious metal and is relatively cheap, and nickel is even cheaper but can trigger allergic reactions. Platinum and palladium is ever increasingly used but it's harder to work with and is actually more expensive than the gold it replaces. Lesser grades of gold such as 9K tends to shy away from using anything of value to form an alloy and may be mixed with brass, copper, tin, zinc, iron, aluminum or even with other cheaper alloys. Often these cheaper metals are added to finer quality jewelry in order to achieve a particular color. 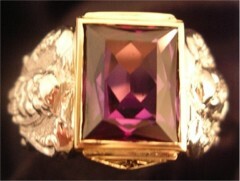 Silver and bismuth, for example, gives "black" gold. Thus explains the difference between the different qualities of gold and provides an explanation when you hear that 10K gold is more durable and harder than a 14K gold ring. The 10KT gold ring is diluted with other alloys that are stronger, harder and more durable; making the ring more resistant to scratching, denting, bending etc. When I am asked by my customers which quality I recommend, I ask two questions. First of all, if you are going to be wearing the ring on a daily basis; what is your profession? If you are a person that tends to work with their hands out in the elements or if the ring is going to be exposed to harsh chemicals etc; I would recommend a 10K ring. 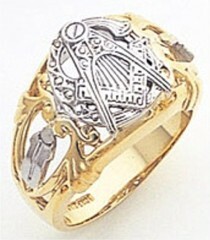 If you are a "paper shuffler or desk jockey" you have the choice because a 14K gold ring will withstand the wear. The next question that I ask is: Do you have budget constraints? Of course we all do, but don't break the bank just to have a 14K ring. 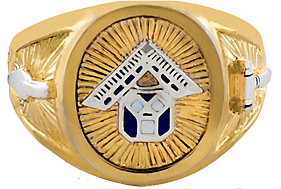 A 14K Masonic or other fraternal ring is going to appear a little more yellow because of the color of the gold but most people that are going to see your ring probably are not going to be able to see the difference if you keep your ring clean and polished. 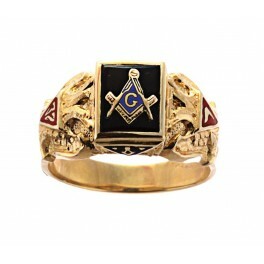 I hope that I have been able to answer your questions and hope that when you are in the market for a quality Masonic ring or other Fraternal rings you keep us in mind when making your selection at Fox Jewelry. If you have additional questions, please feel free to email me at: mfox@cableone.net call me at 712-239-6155.